SARUU, KYRGYZSTAN — I left Bokonbaeyvo early enough to explore a bit of the route along the south shore of the great big lake Issy Kul on my way to Saruu where I was meeting up with the local Kok Boro team. Kok Boro is a game of horsemanship where the players compete for possession of a goat carcass. It is a test of skill, strength, courage and endurance for both men and horses, and to the uninitiated eye it can look a bit like a riot on horseback. One by one the young men and boys began arriving to the field on horseback. A goat was taken from the back of a car and sacrificed after a prayer, then its carcass was placed in the center of the field and the game began. 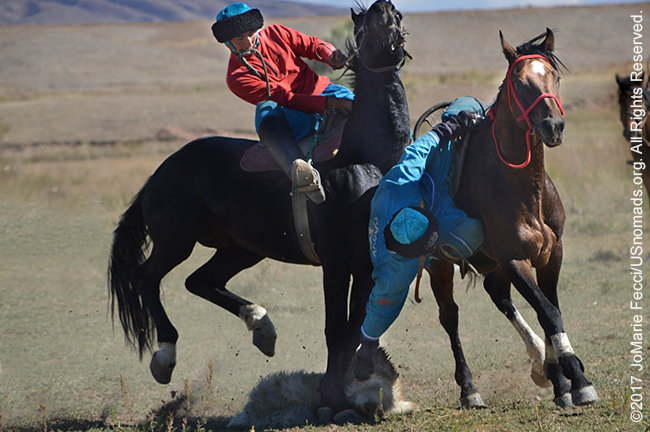 It was a rough game that required great skill on horseback but also strength and flexibility to be able to reach down while riding to pick up the heavy carcass. The men seemed shy and delicate on the sidelines, but once they were on the field they were tough and rugged, chasing each other and competing for the prize. It was an ancient game, formalized into modern-type rules. The horses and men moved as one, and the animals were as rough as their riders in the quest for a win. Speed, agility, fearlessness — the qualities of warriors — were highlighted in the play, and the winners proudly rode back with the goat at the end of the match — though everyone would be invited to share in the meal afterwards. The players were mostly long-time friends from the same village and the game was all in fun. The goat meat would be the main dish at dinner, and after the match some of the players helped prepare it. I was invited to dinner too and happily joined the group, though the lack of a common language was frustrating. We tried our best to communicate with bits and pieces of english and russian and a lot of smiling and nodding and gestures in an attempt to share more than just the meal.